Sugarlane Designs: Double whammy–FNWF & Birthday-Love Stash! Double whammy–FNWF & Birthday-Love Stash! It’s always a good feeling when you can multi-task and get more than one thing done at once, and that’s how I spent my Friday night…. 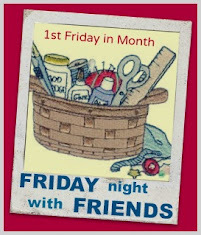 glass of wine, good tv shows and stitching some goodies that will fit both criteria….. Still a little more to be done to these girls but neeeearly there! I’m feeling good seeing as I can get some more things in my stash….how about you? Don’t forget, if you want to join in with the Birthday-Love Stash this month, and be prepared for any upcoming birthdays or special events (that you generally forget until they’re right upon you, like I do!!!) then add your name to the Mr Linky tool that you’ll find on THIS POST. There’ll be something wonderful as a prize for one of our Birthday-Love Stashers at the end of the month, so don’t miss out, and have the added bonus of being more organised too! I’m off to visit some of the other FNWF pals to see what they’ve been up to….come with me for a look-see!? Well done! I love those little ladies! Great work Wendy... just LoVe 'em! Those girls are so cute. You were super productive on Friday.